* How will an increase in digital projection affect projectionist roles? * What new skills challenges do staff face? * Is there room for new skills to be developed alongside the current skillset? * Are significant job losses a necessary consequence of digital projection? * How will digitisation affect career development? – Two historic cinema buildings in Scotland’s two principal cities, Edinburgh and Glasgow, face demolition. The razing of Clerk Street’s Odeon Cinema (pictures right) has been given the go ahead by Edinburgh’s City Council, but “Proposals to demolish the auditorium of an historic cinema in Edinburgh are “not justified”, according to a report commissioned by Historic Scotland,” reports BBC News. Meanwhile, The Scotsman reports that, “a historic former cinema in Glasgow is facing demolition after fire ripped through it in the early hours of yesterday morning…The Coliseum had fallen into disrepair and was on the Register for Scotland Buildings at Risk list. 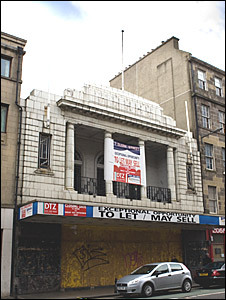 Originally a theatre, it opened in 1905 and was based on the now demolished Ardwick Empire in Manchester, and seated almost 3,000 people.” It was the first cinema in Glasgow to show ‘talking pictures’, but like all-too-many UK cinemas only survived as a bingo hall in its last 15 yearts of existance.